Located at the heart of Burwood CBD. 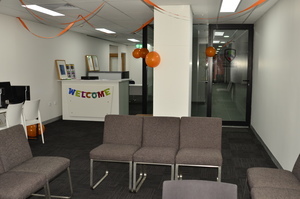 Next to burwood stations in a modern building with brand new fit-out. 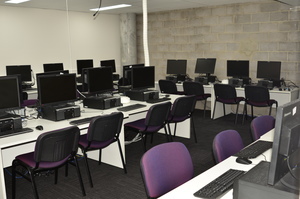 We have 3 class rooms and 1 fully equiped computer lab, each room seats 25 comfortably or upto 40 if set up amphitheatre style. Can be used for seminars/workshops/presentations/training/tutoring etc. Available for hire on hourly, half day or daily or weekly basis. Long opening hours. If you require different arrangement please contact us, we will try best to accomodation. 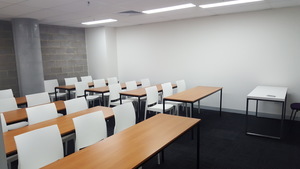 Features are: –	Next to Burwood station (2 mins walk to station) –	Modern building with brand new fitouts –	1 Fully equiped Computer lab with 24 computers & 1 trainer computer –	3 class/lecture room seats 25 comfortably or upto 40 if set up amphitheatre style. 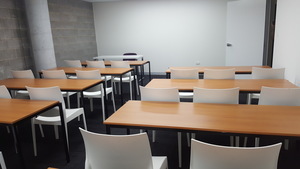 –	Suitable for seminars/workshops/presentations/training/tutoring/coaching –	Available for hire on hourly, half day or daily or weekly basis –	Weekday, evening and weekend opening hours –	Projector –	Whiteboard with markers –	WIFI connection –	Self-serviced tea/coffee in kitchen area –	Filtered water –	Freeze, microwave –	Internal common area seating –	Disabled toilet facilities Hourly rate: $60/hr Half day rate: $150 (3 hours) Full day rate: $250 (7 hours) (between 8:30 am-9:00 pm) Weekend venue hire* On the weekend we will open our space up for hire for those wanting to run creative workshops. Weekend Daily rate: $250 + gst (+$50 bond) (9am-5pm) *A valid Public & Products Liability of $10 million certificate of currency is required. *Rates subject to 10% GST. Rooms subject to availability.